Living in sunny Phoenix, Arizona one would never expect that plants being injured or dying by freezing overnight temperatures was a concern. Believe it or not it happens more than you would think and here are a few tips from Green Goddess Nursery that may help save your plants when those sudden freezing temperatures occur. When purchasing your plants ask your Green Goddess Gardening expert if the plant is classified a “hardy” plant which can tolerate freezing temperatures for a short period of time or a “tender” plant which is more likely to be injured or die during temperatures in the freezing range. “Tender” plants include succulents, bougainvillea, citrus, avocados and fuchsias to name a few. Protecting your plants in a climate that does not see many freezing temperatures can be very tricky since time to prepare can be very short. At 32 degrees there may be slight damage to a few leaves or so. However, freezing temperatures injure plants by damaging the cells and cell walls of your plants beyond repair. This will cause death to the affected area of the plant. The solution for protecting your plants as suggested by the plant staff at Green Goddess Nursery starts as easy as bringing your potted plants inside from your gardens. Next, water the “tender” plants thoroughly, except the succulents. Heat is stored better around the plant in the soil and keeps the roots of “tender” plants warmer when wet. 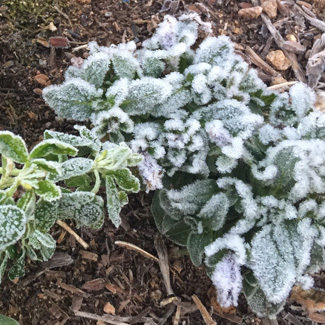 Using protective covers meant for plants is ideal for protecting plants from overnight freezing. Use stakes to prop up the covers so as not to damage the plants. When temperatures rise during the day remove the covers. For a short term cold period apply a layer of mulch which will act as insulation keeping heat in and protecting your plants’ root system. A lamp of 100 watt that is especially designed for the outdoors should be placed in a small tree. It will be able to generate enough heat to protect against frost damage. Holiday lights can serve the same purpose as long as they are not LED type of lights. Always choose plants best suited for your area. Plants are very resilient and though they may appear dead after a freeze, always wait until temperatures warm for a significant period of time to see if new buds or leaves appear. Never prune the affected area or dig the plant up until the temperatures warm significantly. After you have noticed new growth, then prune the area affected by the freeze. The “hardy” plant has been described as being “perennial”. These plants only need to be planted once. They will return year after year. Trellis plants also do extremely well in the occasional sub-freezing nights. The same suggestions to shelter these “hardy” plants will be the same for the “tender”. But no harm should come if you do nothing. Green Goddess staff is always available to answer all your questions and help with any problems regarding proper care of your plant. Spring sale has arrived, discounts on all trees! How to Build a Raised Garden Bed!